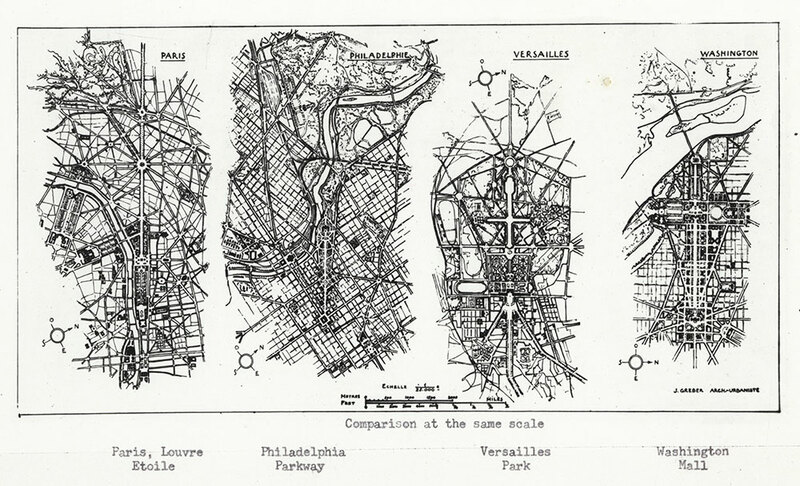 This is a copy of a Jacques Gréber sketch, making a comparison at the same scale of the Louvre Etoile in Paris, the Philadelphia Parkway (i.e., the Benjamin Franklin Parkway), Versaille Park, and the Washington Mall. Gréber was one of several urban architects who created designs for the Benjamin Franklin Parkway. It was his revised 1917 design, made to emulate the Champs-Élysées in Paris, that was ultimately used.